The phenomenal quality of modern tabletop games is a blessing and a curse for a reviewer. It means there’s almost always a reason to be enthusiastic – very few games, save for those marketed and playtested exclusively on Kickstarter – are genuinely bad. At worst, most games are simply mediocre or ‘not for me’. However, it also occasionally means a game that would have stood out as exceptional a few years ago ends up with a review that says ‘Great, but why would you buy it?’. 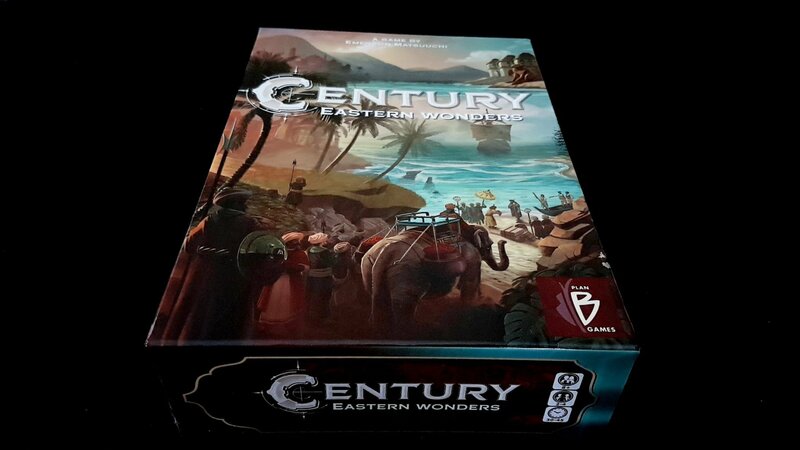 Century: Eastern Wonders falls into that awkward category. We gave it four stars in our review but can’t think of many reasons why you’d go out of your way to pick it up over any number of other equally great games. But perhaps here is where we get an opportunity to spin a recommendation your way – perhaps the flavour of recommendation we can give you is ‘it’s accessible!’. Every game gets a second chance to shine here on Meeple Like Us. Is that the case here though? Well, we’re not starting off well. First of all, the conversions displayed on the market tiles are sometimes difficult to differentiate, particularly the reds and browns and the yellows and greens. To be fair, they can be told apart but their distinctiveness is mostly when they’re used in combination. As in, you can tell a yellow from a green when they’re side by side but it’s not going to be as easy to tell which is which unless you have some kind of reference point. 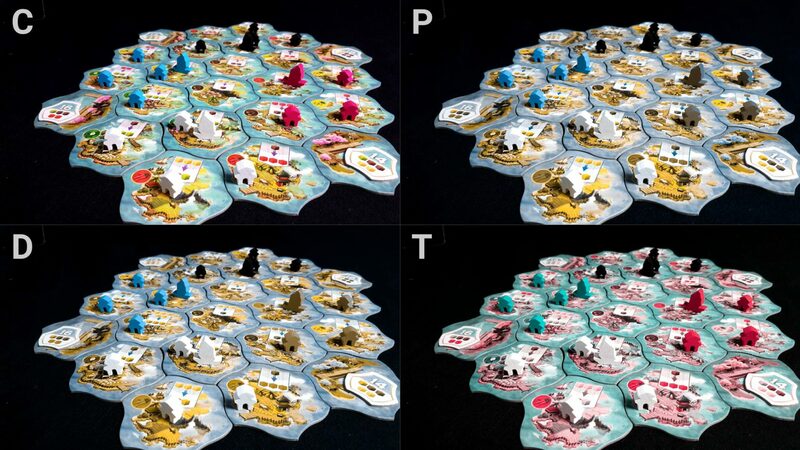 Player ships and outposts are a more encouraging story – white, blue, pink and black are used and these are going to be fine for most standard categories of colour blindness. More uncommon varieties though may struggle because the only channel of information used here is colour. You can see how this could become an issue when you look at the expanded map with outposts placed. Imagine a player with monochromatic vision trying to make sense of a layout like this. 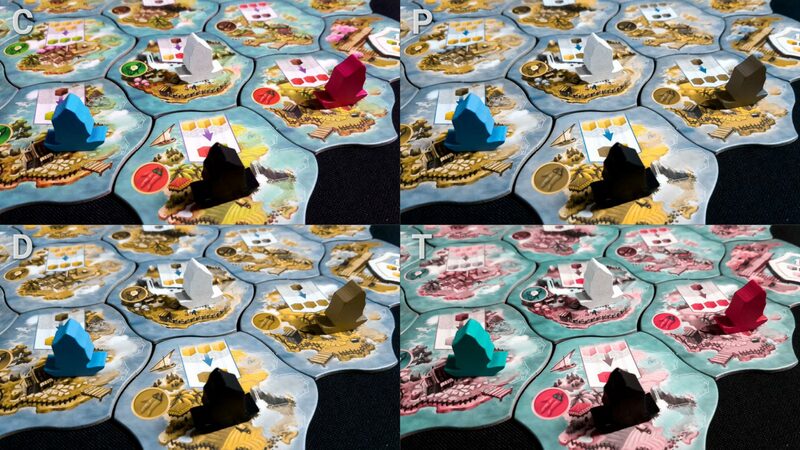 And, since it uses the same colour cubes as Century: Spice Road – a problematic design choice that’s going to haunt the whole series, as we’ll discuss later – we see a familiar problem there. We don’t recommend Eastern Wonders in this category, especially if you play From Sand to Sea which also introduces the problems of the cards outlined in the Century: Spice Road teardown. As the game goes on, the board becomes very visually busy and difficult to parse even for a sighted player. The main problem is that the trade routes and outposts you build during the game are the tools you use for spice conversion and their relevance is highly situational. It’s all important and you can’t realistically discount any of it. For example, we may need to convert three ginger into two tea in order to claim a port tile. If we go by what our opponents have accomplished, perhaps we have three turns to do that and get to the port ahead of them. That’s a process of timed alchemy that is enabled by position and availability of trade options. Perhaps can discard some cubes to get to a tile that lets us turn three ginger into a tea and a chili. Then perhaps we want to claim a market tile to give us the upgrade that gives us a spice refinement option when we build an outpost. Or perhaps we want to sail off to another tile that lets us turn a chili into three ginger so that we can go back to the first and repeat the action. Perhaps we want to do that first to save a bit of travel time. Perhaps we can get the missing tea cube by going to a tile someone else moved through. These, and many other options, are available to you and your job is to assess all of these and optimise accordingly. Those options though are spread over twenty-four tiles, some of which will be unavailable, and they’ll all need to be assessed against what an opponent can do and how quickly. It’s a lot to parse. Close inspection will be necessary and often in circumstances where options are obscured. There are marked locations for outposts that make sure they don’t go on top of the market actions but discipline is required to make sure they’re employed. Even if they are, cubes and ships add additional visual obstacles. There’s some physicality to the game state in that it’s possible to identify the presence of outposts, boats and cubes by touch. The gaps between tiles also show when one tile begins and ends. However, the only difference between components of a classification is the colour. When the board is at is most busy it may not be obvious visually where one blob of colours begins and another ends. It’s also reasonably easy to lose the location of ships in a mass of outposts. Querying the table is possible, but there’s only so much you can work out with regards to your options by doing this. The player board you get is well contrasted, and the victory point bonuses for placing outposts are easily memorised and are presented in a large and clear font. Cabin hold spaces are poorly contrasted against the background, although in the end you just need to remember what your cube limit is. Moving to From Sand to Sea will also introduce additional complexities with regards to the Century: Spice Road cards as they are referenced in that game’s teardown. Unfortunately, we don’t recommend Eastern Wonders in this category. 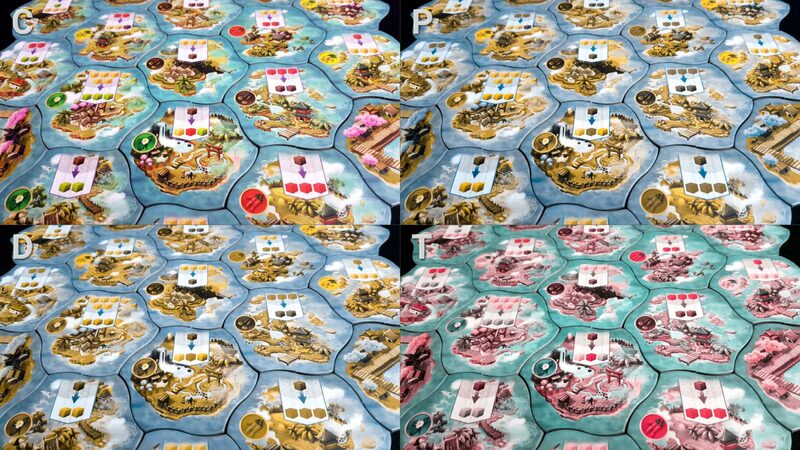 The rules at the core of Eastern Wonders are not particularly complex, but they do require players to build a sophisticated understanding of the different conversions they have available on the board. 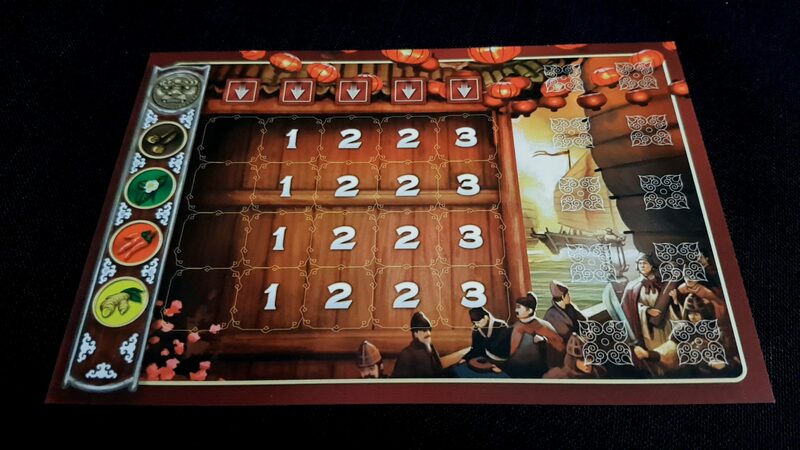 The trick of Eastern Wonders is not so much to build an engine of spice trading but to work out which of the trade routes available on the board are most appropriate for the goals you are currently trying to hit. This involves a fair amount of mental forward and backward tracking that needs to mediated by the spatiality of the board and the time constraints set by other players at the table. None of the individual conversions are difficult but chaining them together might be. In the end it’s doing a kind of tree-based search in your mind. You need a green, two browns and two yellows. You have two reds. How do you accomplish your goal? Whether you’re on to a winner with a path like that depends on how you can bring it around to its conclusion. That’s difficult, made more so with the upgrade options that outpost placement will permit. On to that you add the timing difficulties that come along with actually getting to the market tiles to use their powers. Maybe you can get what you want in three conversions, but the cost is eight turns or cubes of movement. Is it worth it? It depends on what your opponents are doing. I find this spatial calculation to be the most interesting part of Eastern Wonders, but it’s the card calculation of Spice Road dialled up several notches on the complexity dial. Imagine if when you played a card in Spice Road it changed how long it was before you were able to play any other – some could be played more quickly, some more slowly. That’s essentially what the physicality of Eastern Wonders does to the game. Game flow at least is straightforward and there is no literacy needed. Numeracy is primarily stressed implicitly, although there is the explicit aspect of scoring to consider. There are no short-term synergies in the game but plenty of conversion combinations that will work extremely well together because the outputs of one are optimal as inputs for another. Finding short-distance synergies in the map is important to accomplishing goals quickly and efficiently. As far as memory goes, there’s nothing in the game that explicitly stresses it. Everything you need to know of play is represented on the board and there’s no uncertainty except from the order in which port tiles will come out of the draw. However, you do need to at least be able to hold an idea of a plan in mind long enough to act upon it. That may be difficult for the longer chains of effect but it can be noted down somewhere to ease the issue. We don’t recommend Eastern Wonders in our cognitive accessibility category but we can recommend it for those with memory impairments only. There’s more player interaction here than there is in Spice Road, but it’s still not a game of direct competition. You need to pay players to land on the tile they occupy and there are opportunity costs that come with building outposts – the longer you leave it the more expensive they will be. The biggest emotional inaccessibility here is that you can often find port tiles snapped away from you through no fault of your own. When a new port tile is dealt out, the chances are it’s the player that has the best match of spices in their hold that will be able to claim it. There’s no advance warning of what a port will want and so you might find that winning a tightly fought contest just opens up a better opportunity for an opponent. Similarly, it can sting if someone claims a port tile you have been working towards and leaves you meaningfully unable to complete any other for a while. This is especially frustrating given that claiming port tiles is the thing that decides when the end-game comes around. You can be caught off the hoof with no opportunity for you to be on… the… hoof… is that actually a phrase? The game is very hoofy, let’s just say that. Eastern Wonders takes a bit longer to play than Spice Road in my experience, and that means it’s not quite as easy to simply mitigate these issues through tournament style play. That said, Eastern Wonders is actually a somewhat fairer game than Spice Road in this category. Within Spice Road you can be locked out of getting any useful cards if you’re in an unfortunate position in the seating order. The worst that can happen to you in Eastern Wonders is that you need to pay a little more for an outpost. Unless From Sand to Sea is being played, nobody has a unique engine – the same parts are available to everyone, just not with the same buy-in cost. We’ll recommend Eastern Wonders in this category. 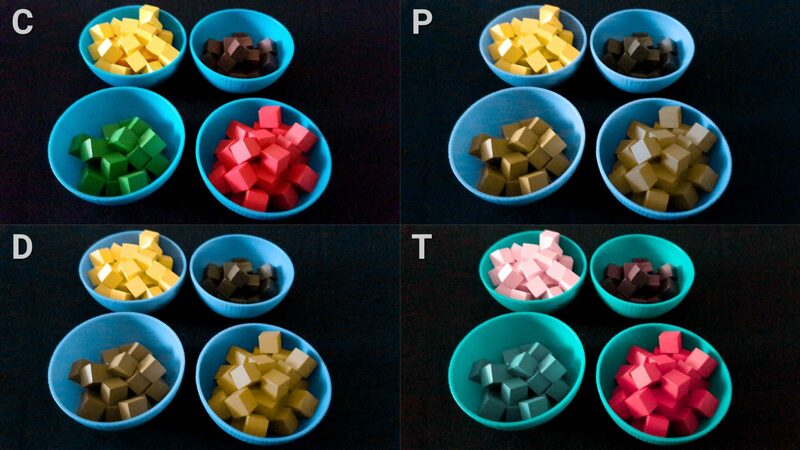 There’s an awful lot of cube management in Eastern Wonders and in this the cubes suffer from the same problem as Spice Road – the bowls are a nice component but they do make it difficult to scoop necessary cubes out. They tend to slide up the interior of the bowl. As with Spice Road though their usage is optional. 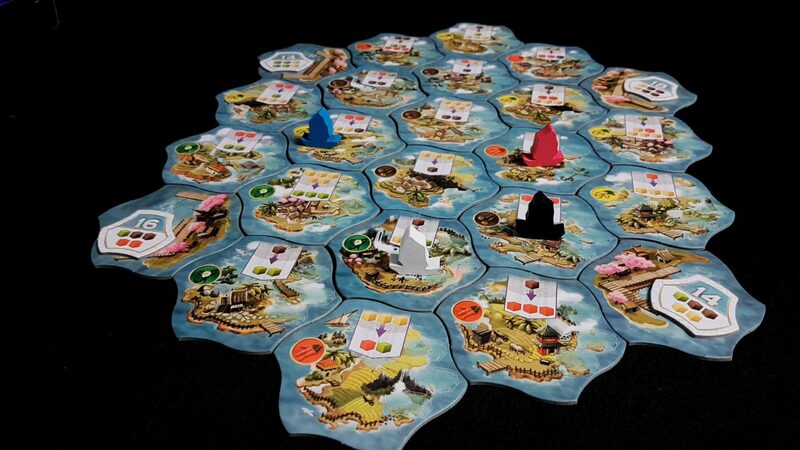 Mostly what you do in Eastern Wonders is move a ship around, place outposts, and trade cubes. The problem with the first two of these is that the board becomes physically busy as time goes by. The tiles are generously proportioned but the expected locations for the outposts are less so. If you don’t use those little segments it’s easy to cover up key information. As is usually the case, there’s no reason that this manipulation need be done directly by the active player. Verbalisation though is not explicitly supported even if it can be done through awkward identification. Something Forbidden Island style would have been great with each of the island tiles getting a unique name. However, they do have a kind of name in that the conversions are distinctive. ‘Move my ship from the one brown to three red tile and onto the three yellow to one red and one green’. Or, ‘Move my ship one tile southwest’. That latter is certainly more convenient but the hex layout means you need to agree upon what cardinal directions exist. It’s not impossible, just less convenient than would be ideal. Aside from this the contents of the player board in front of someone is pretty much where all the manipulation exists – pick up a specific outpost and manipulate the specific cubes in your hold. The board (or an equivalent layout on the table) needs to be used for outposts because of the way the set bonuses work. That can occasionally mean you’re picking one out when it’s surrounded on three sides by other outposts. If they’re disturbed they need to go back the way they were for an accurate reinstatement of game state. We’ll tentatively recommend Eastern Wonders here because verbalisation is feasible, it’s just not optimal. The cover shows a lot more men than women, even accounting for the ambiguity of distance. I’ve also seen some complaints about the theme, such as it is, uncomfortably brushing as it does against whiff of colonialism. The introductory blurb of the game comes with all the necessary code words to invoke that… ‘exotic lands’, ‘opportunity’, ‘you seek to control this region’. While Eastern Wonders is better at implementing its theme than Spice Road, it’s still not strongly expressed enough that this comes through in gameplay. Bear in mind though that these spices are coming from somewhere if you want to look deeper into the thematic elements. The manual doesn’t default to masculinity, using the second person perspective throughout. Eastern Wonders has an RRP of around £34 and I can’t complain about it at that price-point, especially if you already have Spice Road. In that case you essentially get a third game by banging together the first two. However, that has to be put in context – I don’t think From Sea to Sand is as good as Eastern Wonders. The Century system has made heavy mention of this feature in its marketing. It’s a sound idea implemented reasonably well in the design but there is, in my mind, no reason to own both just so you can play the combination. There is no need for literacy and no need for formal communication during the game. We strongly recommend Eastern Wonders in this category. I don’t think there are any serious intersectional issues that wouldn’t already be handled by a grade in an individual category. The only one really is that the game is likely to be somewhat frustrating to play if a physical impairment intersects with an emotional impairment because of how often key information will be obscured and how often you’ll need to ask for the game state to be adjusted. That’s going to be an issue regardless but I could imagine it becoming a trigger. Eastern Wonders, despite citing the same playing time, seems to me to take a fair bit longer to play than Spice Road. Luckily it does support dropping out to an extent since there’s little inter-player agency and nothing changes with different player counts. Nobody monopolises tile resources, so it’s not even as if the competition landscape changes particularly much. You can just leave their outposts on the board and play on. Well, unfortunately Eastern Wonder’s emphasis on spatial layout creates a number of accessibility problems that put it out of easy play for a lot of people. So much visual processing of complicated trade routes was certainly going to have an impact on play. 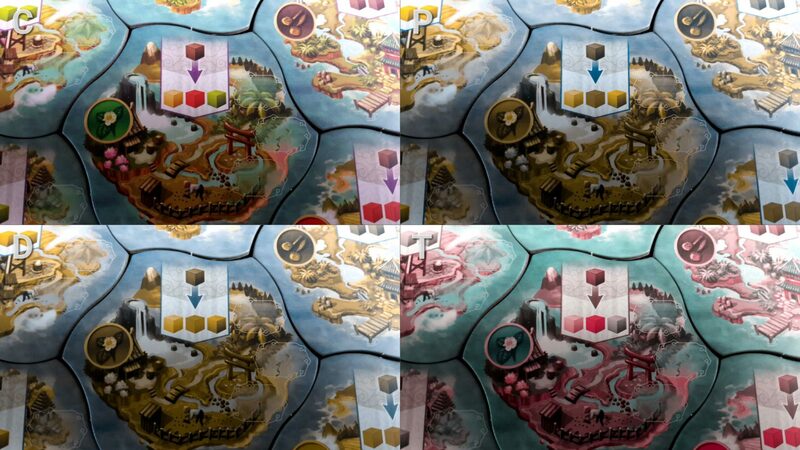 I would say that it was baffling to me that the colour blindness issue wasn’t corrected in Eastern Wonders, but the truth is it’s a consequence of the Century design. Short of reprinting the cards and having two incompatible versions of the game they’re stuck with the colour choices laid down in Spice Road. You can’t have the cards refer to colour coded cubes if you change the colour scheme half way through. I expect we’ll see the third game in the series do equally poorly in this category. You can see some improvements though with regards to the pieces that can be easily fixed – the ships and outposts for example. It’s an important lesson in considering accessibility early and thinking it through all the way to its conclusions. Pretty much the only chance there is to fix this is through an incompatible second edition of each game, or a new and shiny big box version. 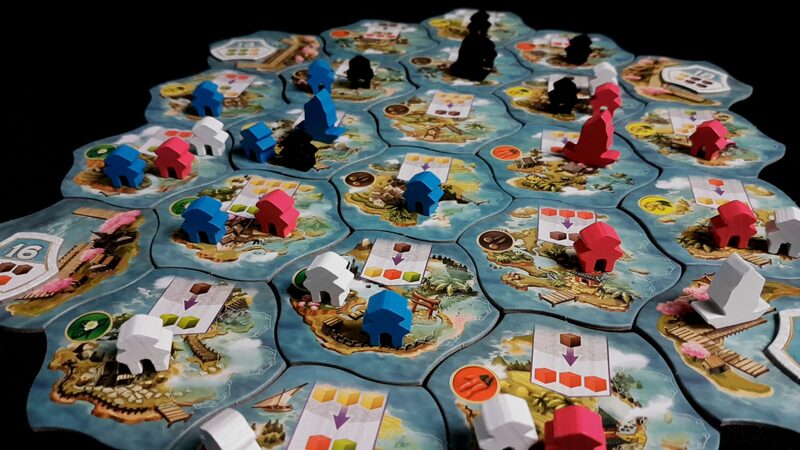 I liked Eastern Wonders more than Spice Road – quite a bit more, actually. Unfortunately for those that might be considering replacing the original with this they’re taking on a more inaccessible game. 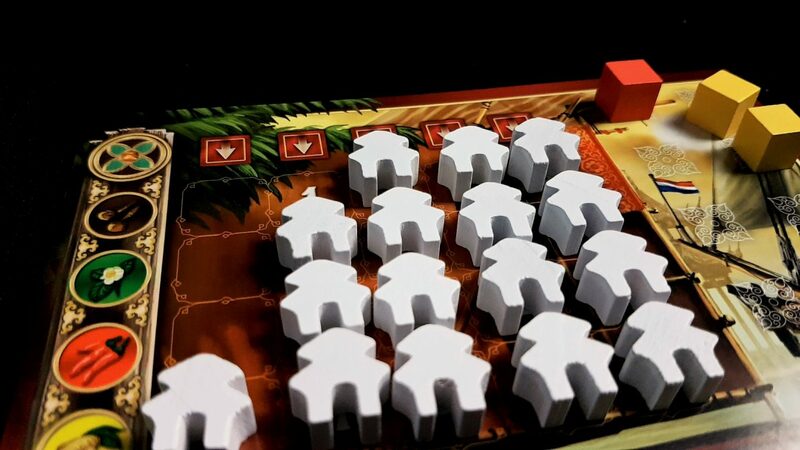 We gave Eastern Wonders four stars in our review, but Spice Road is the one to go for if you’re looking for the most accessible game, so far, in the Century stable.